As a leader in the area of high-quality, science-based mold testing, Cromwell Environmental utilizes the most state-of-the-art mold sampling equipment for our microbial investigations. Our professionals are all highly trained experts: not just in industrial hygiene, but also in the fields of water mitigation and building science. Because of our knowledge of moisture damage and mold contamination we better understand where hidden mold is found. Having completed tens of thousands of mold inspections and more than a thousand mold remediations, our professional staff is experienced in handling projects ranging from small residential homes to corporate and industrial facilities. Our clients range from private individuals to REO/foreclosure departments of some of the largest corporations across the country. Whether we're testing an individual home for mold for a local homeowner or Realtor, or for your firm's relocation customers or REO/foreclosed home inventory across the country, Cromwell Environmental takes the same highly scientific and professional approach. Your results will be compiled in an easy to read report which will outline professional observations with photos, graphs showing the amounts of mold seen indoors relative to "normal" outdoor levels, the types of mold seen (Stachybotrys, Aspergillus, etc) and mold concentrations, as well as a scope of work for remediating, or clean-up, of the mold. Many times moisture is present behind walls. To properly identify moisture and leaks inside wall cavities, Cromwell Environmental utilizes moisture meters or infrared cameras. These cameras enable mold inspectors to determine the exact location of water intrusion and moisture so that steps can be taken to remove the correct materials and solve the underlying moisture problem. Our firm’s philosophy is that while mold is a problem in buildings (both from a health and a liability perspective), this problem can be solved quickly, easily, and completely. With few state or federal mold regulations in place, a highly qualified and experienced mold remediation firm is a must. 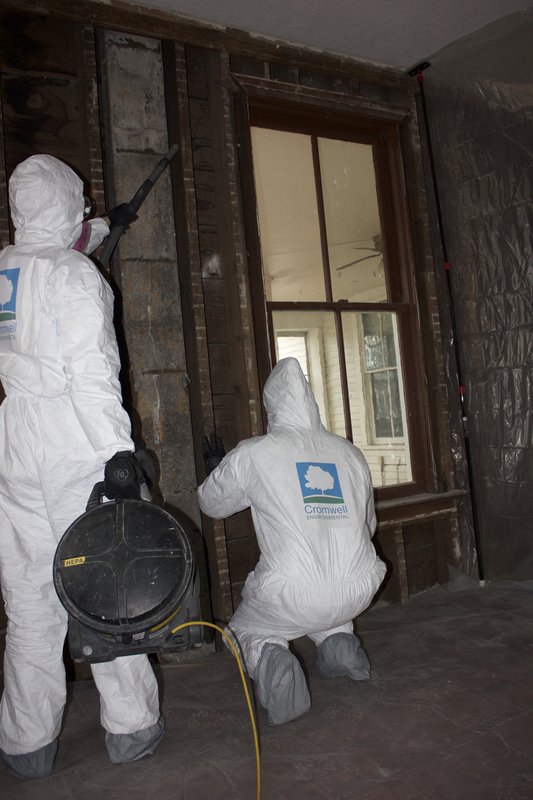 Having conducted over a thousand mold remediations in a variety of property types, our experts are qualified to conduct, design, or oversee any mold remediation project conceivable. Our extensive mold remediation experience allows our professional staff to recognize the most effective and efficient mold remediation plan for your property, saving you both time and money. Our projects are designed and run by individuals with mold certifications such as Certified Microbial Remediation Supervisor (CMRS). We are fully covered by General Liability, Environmental, Mold Specific, and Workman’s Comp insurance, all of our employees are bonded. We always guarantee that after our mold remediation the building will meet clearance standards and the indoor air quality will be at “normal” mold levels or better. With some information on the problem and site photos Cromwell Environmental can provide fast (2-5 days) and totally free bids. We offer firm proposals to take care of all of the mold in an area of the home and won't raise our price in the middle of your project. Please contact us for information about how our quality services and competitive pricing can benefit your situation. Call us at 785-749-6020, or contact us here.